Veneer generally is used for fireplaces, chimneys, and on walls(interior and exterior) in homes and businesses. Our building veneer ranges in thicknesses of 3.5" to 5" and our thin veneer is between 1.5" and 2.5" thick. Veneer is sold by the ton and can be hand selected upon request. Veneer can greatly enhance the allure of fireplaces, chimneys, entrance ways, and walls. Our Veneer is natural stone and does require some creativity, labor, and some special tools to achieve your desired goal. 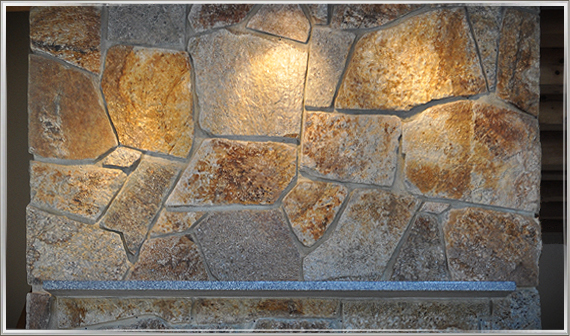 Consultation on any veneer installation is available at Unity Stone Quarry. Our Staff has over 30 years of experience installing walkways, patios, retaining walls, decorative walls, fireplaces, veneer applications, and chimneys.